Tagged under Matsuri Hino, Studio DEEN, Light Novel, Series, Drama CD. Yuuki Cross has no memory of her life before the age of five, when she was attacked by a vampire and strangely enough saved by another vampire called Kaname Kuran. Ten years later, she now lives with her adoptive father, Kaien Cross, the headmaster of Cross Academy - a prestigious private school with an unusual class structure: the Day Class, which is made up of ordinary students, and the Night Class, an elite group of 'beautiful people'. Along with Zero Kiryuu, who was also a victim of a vampire attack that killed his whole family, Yuuki guards the school and the Night Class's secret: the Night Class is made up of vampires! What should happen if the Day Class discovered the Night class' secret? And what is Zero hiding from Yuuki? And the ultimate question: Who will win Yuuki's heart? Kaname or Zero? The franchise consists of 2 TV series: "Vampire Knight", "Vampire Knight Guilty", and 3 light novels: "Ice Blue Sin", "Noir's Trap" and "Fleeting Dreams", written by Ayuna Fujisaki. Though it is meant to be a serious and sad anime, the show does have a few humorous scenes. These mostly revolve around Chairman Kaien's over-motherly attitude towards Yuki or Zero's hate of almost anything on campus. The humor is inserted cleverly between less-serious scenes so the process doesn't seem brutal. The most memorable humorous scenes that come to mind are the ones present in the first episodes where Yuki and the other school prefects attempt to hold back a sea of overly-hyper girls from the Night Class boys. Even if the events can seem a bit over the top sometimes, Vampire Knight is an enjoyable anime with an interesting story. It certainly brings a new idea to the table, that being a vampire isn't really that easy or glamorous. Vampire knight is my best anime i've ever seen right now,althought the story seems like there's something missing,but still,the characters are likeable,the artworks is simply amazing,and the soundtrack is the best thing in the anime,i started to watch the anime before the manga,when i finished the anime,then i read the manga,and i found a very huge difference between them,the anime is more rushed and many cutted scenes,while the manga shows more than the anime,anyway,may the series is very sad but there's some humorous scenes,it's a very enjoyable anime. about the main heroine,yuki,i like her, but they shouldn't have focused on her,they at least should focused on the other purebloods like ruka,aidou,Kain,Shiki,rima and takuma,they have better and funny scenes. -My favorite characters are Yuki Cross,Zero Kiryu,Ichiru Kiryu,Rido Kuran and Juri Kuran. 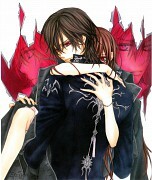 Kaname Kuran x Ruka Souen. the style of this anime is very great, i like it very much, vampire theme is awesome, the drawing is very special and amazing, i didn't see it in any other anime specially there outfit, it's very unique and beautiful, the story is cool and also the characters but the main heroine "Yuki", yeesh!! she's so annoying!! she keeps running away from Kaname like he's some kind of a monster or something while in fact Zero is the one who hurt her, well, whatever, i hoped she ended with Zero cause she doesn't deserve Kaname (the most awesome vampire and the only vampire i love) he's so elegant, and let's not forget the OP theme song it's amazing, i never skip it in any ep. , any way, still this anime is one of the special ones. I've heard the dub, it would've sounded better if Funimation got it instead of Viz in my opinion. I have seen both seasons. Though Zero has his moments when he makes things really complicated for himself. I thought Yuuki was cute. I just wish Yuuki would really make up her mind about who she really wants to be with. The manga ended somewhat the way I expected; though in the end she technically picked no one. Though Kaname was super manipulative & Zero could never just figure out what he wanted & just stick with it. This is one of the best vampire anime series. The thrill and love will get you really hook, so if you hvent seen it watch it NOW. I've the whole Anime (season 1 and 2) and overall it's pretty good, although the manga has a lot more to it. they missed important moments though, and also as it's not complete as most anime's are, that was disappointing. the ending...for Yume fans is nice though. if you're a Zeki you'll be not happy lol. The first anime I saw. I fell in love with Zero, and totally love the story as the characters. Although I thought it was very sad history between the three protagonists. I wanted to Yukki stays with Zero, already that Kaname don't like much. The end was not as I expected. Although I consider it a very good anime. Well it's a short and a nice anime. Both the seasons were quite interesting. I really like the ending part of season two, where Yukki's hair becomes long and her that weapon becomes a sickle and even zero's gun though the looks is a lil' disappointing the power boost is quite awesome after living under Kaname's power. Well both Kaname and zero are cool characters in their own way. But I've gotta admit that tattoo on zero's neck is awesome. People who like vampires will really take a liking to this anime. I love vampires and this anime definitely depicted them perfectly but I found the plot quite boring overall. It was revolving around Yuuki - the main character - too much and there were too many twists I didn't like. I suppose that someone who likes romance and love triangles would enjoy this but not me. Moreover, Yuuki was absolutely annoying and I had a feeling it was actually a mistake to focus so much attention on her. She could have played a less signifacnt role and honestly, I think that if she hadn't interfered with the vamps so much, all of the problems would actually be solved much more easily. On the other hand, I realize that the story wouldn't be so complicated and exciting then but I just couldn't stand her as a character. Thumbs up for the gorgeous art and character design and for the beautiful music. I love vampires, so I really enjoyed this one. The art is beautiful, although it can't be compared to the original, but I think the animators did a good job. The character design is also something that should be praised, those uniforms are amazing and I really liked the seiyuus they picked. 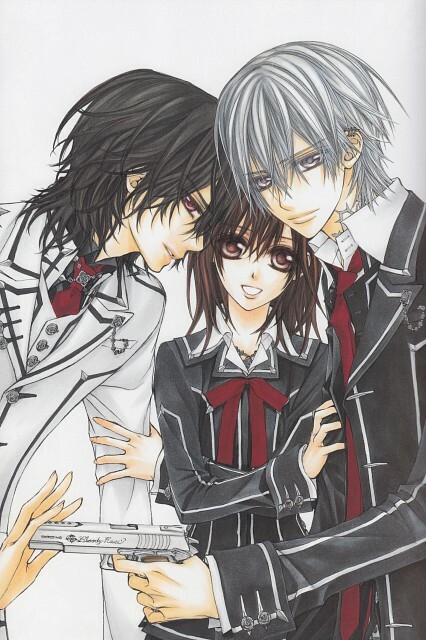 The continuation, Vampire Knight Guilty, was a little bit boring, though. The episodes felt random and like they lost the thread of the story. The art is good. The stories... are so-so. Maybe it's because 'sibling-love' between Kaname-Yuuki that kinda freaks me out. Even though they are vampire who wanted to keep their bloodline, or whatever. I also didnt like Yuuki's masochistic expression when she got bite. My favorite in this series is just Zero Kiryuu. N I love Kaname n Zero stories more than Yuuki stories. ^^ Especially the ending scene between Kaname n Zero on the first season XD. But, because the manga isnt finished yet, the anime endings is bad too. I hope there will be season 3 of it. Meh... I kinda like the art, but the story is pretty stereotypical: good looking guys, strict hierarchy, S/M attitudes, love triangle, heavy issues... There are some scenes with a lot of spice and could have work for better, but no... things kept very predictable and "twilighty". Basically I just hate any story that has a masochistic girl as protagonist or a plot revolving around a cheesy love triangle. And VK happens to have BOTH. It's almost like the Japanese equivalent of Twilight. I heard my classmates talking enthusiastically about VK, so I decided to try it out. I regretted it.